Canada's most affordable and flexible U-Matic To DVD service. Transfer to Uncompressed AVI for High Quality Video Files. Costs just $25 for DVD per 60 minutes of video; extra copies are just $10. Lowest professional transfer prices in Canada, but with the highest quality. NTSC U-Matic Low, High and SP to DVD or Computer file. Verbatim AZO DVD's used for all DVD transfers. Transfer Your U Matic Tapes To DVD Today! Number of 3/4" U Matic Tapes. If you selected "Other" please fill in. Would you like extra copies? Extra copies are just $10 per copy, and please specify how many. Note: HST/GST will be applied to Canadian orders. NEW! U-Matic's can now be transferred to Uncompressed AVI Video Files! Be Warned, these Video Files can take up about 100GB of space for 1 hour of video vs the 13GB for 1 hour as a DV-AVI. Used in television studios and ad agencies throughout the world since 1971, and with numerous studios distributing standard-definition broadcast copies of shows to TV stations and networks up into the early 2000's, U-Matic was a very popular professional video format for decades. While it is no longer at the top in terms of video production, there are still loads of material on U-matic that has not been transferred to a digital format. In the U.K., the BBC has reported that it has about 10,000 hours of video on Low and High Band U-Matic alone that was recorded between 1971 and 1990. You may come across U-Matic Low Band or U-Matic SP tapes which have been recorded by a professional video company, for example in creating training, advertising or promo films. But how can you view the recording? 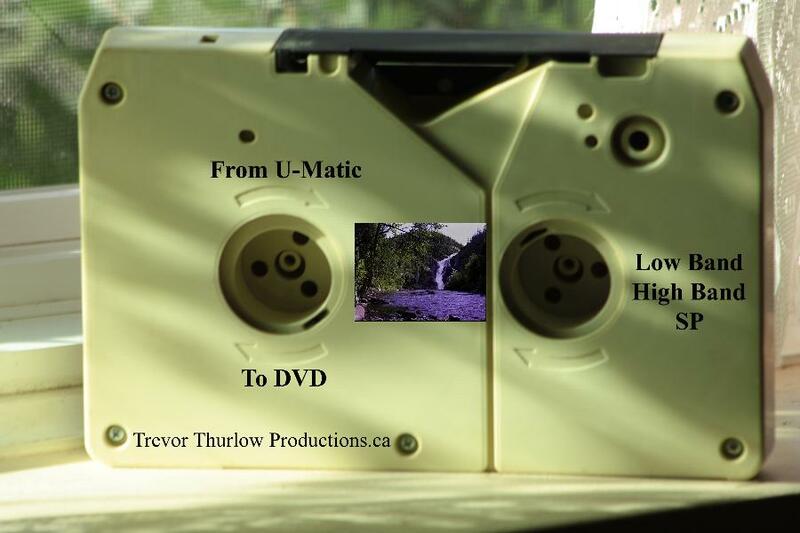 By getting your U-matics transferred to DVD by Trevor Thurlow Productions. 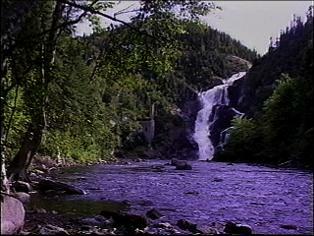 I am able to transfer your U-Matics in very high quality, as you can tell by the frame of video above with the waterfall. Transfers to DV are also high quality; DV is equal in quality to Betacam SP. NOTE: AMPEX BRANDED TAPES. In the 1970's and 1980's Ampex was known as one of the best U-Matic tape manufacturers around. Unfortunately, in the recent years it has been discovered that the tape formula that Ampex used has not lasted and as a result, many Ampex tapes have video in vastly degraded or unrecoverable condition due to tape shedding; even if they were stored in the best conditions possible. I will try my best to get whatever video I can off these tapes, but I do charge an extra $30 for Ampex tapes because they do take extra care and restoration work to recover. Now then there is the odd Ampex tape that does not require this extra care, but this is extremely rare with this brand. Should you have a "lucky" Ampex the $30 charge will be dropped. Other U-Matic brands such as Fuji, Scotch, and BASF seem to have been manufactured with a better formula, but due to age some of these tapes also exhibit tape shedding. Please fill out the form at the top of the page and I will get back to you with in 2-3 days with an estimate. If you are not sure of how long the tapes are. Please be advised that I will not transfer copyrighted, pre-recorded tapes (i.e. Star Trek : The Motion Picture), as I will not be involved in blatant copyright violation. Presently Trevor Thurlow Productions is unable to convert PAL or SECAM U-Matic to DVD. However, I am able to convert NTSC U-Matic's to PAL DVD's or digital files. Considering that U-Matic was used for a lot of Broadcast work, DVD is not recommended, however, if you want a DVD, I can put them on DVD. All DVD transfers use Verbatim AZO DVD-minus-R discs. I've used Verbatim for many years and these discs are, by far, the most reliable discs out there. Options include NTSC Regular/Super Betamax to NTSC S-VHS, VHS, DVCPRO, MIni-DV and Betacam SP. Transfers to PAL are currently only available on DVD or as a PAL video file. Ask for more details. U Matic SP: Here is the same frame from above as an example of the quality of video that you will get from a SP tape. Right off the bat, U-Matic recorded it's signal in the composite format. What this means is that the luminance and chrominance channels (black & white and color channels) were recorded as one signal, using the color-under method to sub-sample the chrominance channels, just like VHS and Betamax. But, because of the 3/4" tape it used, U-Matic was able to record at higher frequencies. Going by the figures above, as you can see, Betamax used U-Matic's chroma channel, but U-Matic always stored the lumiance better. The majority of the time U-matic also produced a superior picture when compared to VHS on the black and white level (although it knocked VHS's color into the dirt all the time). Compared to S-VHS, U-Matic SP was about equal on the black and white level, but again it featured a far superior color.